This is the first article in a series for leaders about agility. Don't miss the second article. 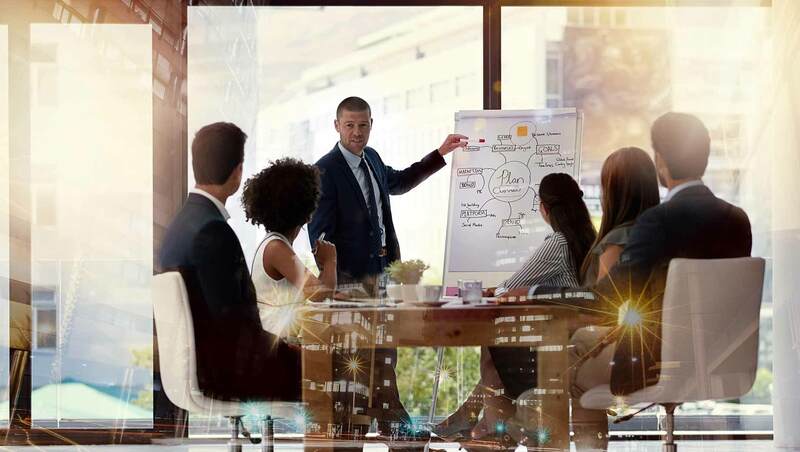 Over the past 18 months, Gallup has been conducting stakeholder interviews with 80 leaders and managers in a multitude of industries and organizations, in order to identify which aspects of agility cause employees to experience their company as agile. No single cohesive definition of agility arose from these conversations. Based on the qualitative findings and as part of a quantitative survey, Gallup developed a questionnaire to help companies understand -- and, if need be, improve -- agile in their organizations. Gallup then interviewed over 5,500 American and 4,000 European workers regarding their perceived culture of agility in their organization. "In my company, we have the right tools and processes to respond quickly to business needs." "In my company, we have the right mindset to respond quickly to business needs." Employees who can answer these two questions affirmatively, the study found, tend to agree that their companies also have eight cultural attributes, ranging from willingness to share knowledge to quick decision-making, that are fundamental to agile. Those eight factors work together and must evolve in parallel. 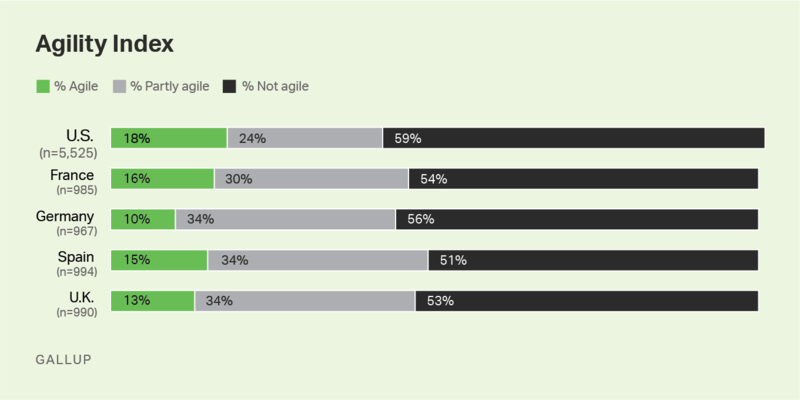 In a separate study, however, most business leaders said agile is a crucial method of delivering products to market and staying ahead of the competition, yet more than half of respondents don't experience those fundamentals of agile where they work. Clearly, most companies want to be more agile. But most companies don't appear to have the culture to support this. In fact, it seems many companies think of agile as a means to do a few particular things. Agile methodology -- scrum teams, Kanban, work sprints -- is saved for selected departments or for discrete projects and is not seen as part of an organizational culture of agility. Some agility experts have criticized this approach, saying that sprints, scrum and even the more sophisticated applications like Scaled Agile Framework are useless rituals in the absence of an environment wired to support fast decision-making, experimentation, a learning mindset, empowerment and effective cross-functional teamwork. In any case, when only a few special-purpose teams do agile, their projects, products or plans get the benefits of agility only in that team. This piecemeal implementation of agile may slow the deliverable to a crawl when it moves downstream. To get that deliverable unstuck, a company would need to expand the scope of its agility framework. But as the Gallup research shows, the cultural and process fundamentals that support agile frameworks are scarce in a lot of companies. Without the eight basics in place, leaders may find agility hard to sustain and almost impossible to scale. Meeting customer needs becomes tougher than it ought to be. And the customer -- internal or external -- is key. If agility is parceled into a discrete segment of production, customers won't benefit much from that team's fast, adaptive, innovative work. Which is a shame because customer centricity is often the reason businesses want to become more agile in the first place. In fact, agile is nearly synonymous with customer focus -- often, agile teams effectively partner with their customers -- which requires agile teams to base business processes on what customers value. That environment affects the way employees think, communicate and act. 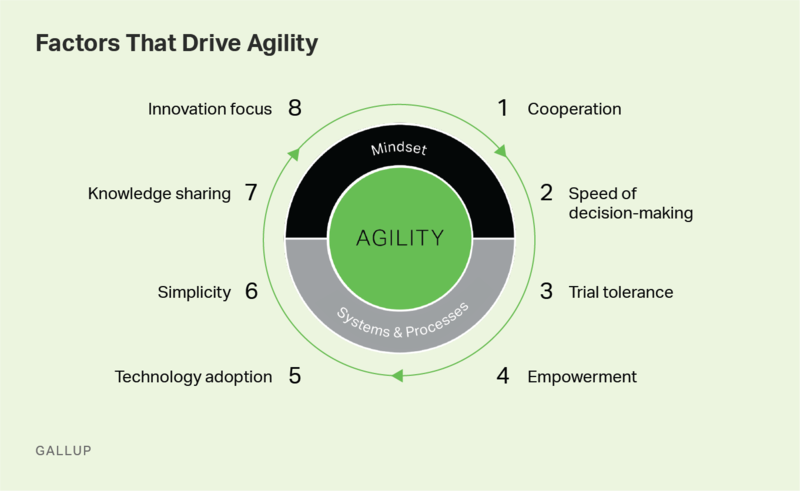 And that's what makes those eight drivers of agility so important: They are the basics of the environment companies must have to be truly agile. Leaders who want end-to-end agile need an agile employee environment. Changing the workplace culture is probably necessary in most companies. And advantageous. Every employee is exposed to unique environmental signals -- opportunities, barriers, risks, gaps -- that could benefit the company and the customer. Their observations provide extremely valuable information. Using it is fundamental for success in a changing market. For instance, salespeople get feedback from customers every day, and project managers determine time frames and product specs. But project managers and salespeople are usually at opposite ends of the product spectrum, each with information the other needs to meet customer expectations. Companies that create platforms that spur communication between the spectrums can produce customer-centric offerings faster. Some companies encourage a mindset that enables agility; most don't. Consider, for example, the cultural mindset of knowledge sharing. According to the Gallup study, only 30% of U.S. and 36% of European workers strongly agree that their coworkers share knowledge -- and that's the best response for any of the eight items. Without knowledge sharing about customers' needs, agile teams function less effectively. One may wonder how they function at all. If the culture doesn't cultivate the right mindset and processes, the organization may find it difficult to inculcate real agility. Of course, the organization's leaders may not even know if they have the necessary culture -- Gallup analytics and advice can help with that -- but most leaders know being slow off the blocks on agility is an increasingly serious liability. For companies already behind, developing the fundamentals of an agile workplace is the best way to pull even. And considering how few organizations have those fundamentals, it may not take long to pull ahead. 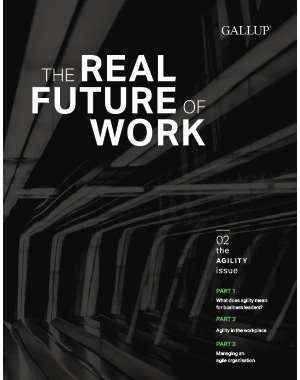 Gallup can help you improve customer centricity by developing an agile workplace.